William Hazelgrove’s THE PITCHER is the story of young Ricky Hernandez, whose main goal is to make his high school baseball team. Ricky has an arm, you see, and a fastball that’s much better than his peers. But as he’s extremely poor, Ricky probably already would’ve dropped out of baseball competition except for one thing: his mother, Maria. You see, Maria is a force of nature. She’s the mother we all wish we would’ve had, growing up. She’s an assistant coach on Ricky’s summer baseball team, not because she cares about the game, but because it’s the only way she can assure that Ricky will get any playing time. Maria’s main drawback as a person is that as she’s so focused on her son, she’s not very good at treating her own health (she has lupus). When THE PITCHER opens, it’s about three months until high school baseball tryouts. Ricky avidly wants to make the team. He knows he has the talent. But he hasn’t had the advantages of most of the other players (especially an obnoxious kid named Eric); his only real coach is his mother, who has learned all she knows about baseball from books. She mostly tells Ricky things like “Take a deep breath” — a good, albeit generic, thing to say — which cannot get to the bottom of why Ricky’s aim is poor and his concentration isn’t where it should be, either. Enter “the Pitcher:” His name is Jack Langford, he pitched in the majors for 25 years, and in Hazelgrove’s conception, was the hero of the 1978 World Series as a member of the victorious Detroit Tigers. (As a baseball fan, I have to admit that I wish the Tigers would’ve won over the real 1978 American League and World Series champs, the New York Yankees. They were fifth in the AL Eastern Division; my favorite team, the Milwaukee Brewers, was third. But I digress.) Langford was a successful pitcher, but since he finished his career life has taken a major turn for the worse. Langford’s wife died, and after that, Langford felt life wasn’t worth living and turned to drink to help himself cope. At any rate, Maria wants Langford to help her son learn how to pitch (rather than merely throw with no control), so Langford starts helping Ricky out. It goes in fits and starts, though, partly because of Langford’s alcoholism, partly because Ricky’s mother’s health, and partly because of Eric’s nasty mother, who will do anything she can — even calling Ricky an “illegal alien” — to keep Ricky away from the high school baseball team. There’s a lot of plot here that I simply don’t have time to discuss — including a rather low-key romance between Maria and Langford — but suffice it to say that everything works well in this novel. There are many, many plot elements, but the balance is right, the tone is right, and we can’t help but root for all of the major characters — Ricky, his pitching coach Langford, and his mother, Maria. So, will Ricky make the team? Will Maria’s health ever improve? Will Langford stop drinking? Or will Eric’s mother win the day despite the nastiness of her tactics? All of these questions will be answered by the time you finish reading THE PITCHER. Bottom line? THE PITCHER is a book that’s more than the sum of its parts. It’s an excellent baseball story that gets all the issues right, it’s fun to read, and it’s a book that all ages should enjoy. The main character is the deceased seventeen-year-old Felicia Ward. She’s a noted pianist with a composer for a father and a diplomat for a mother. She’s traveled all over the world, and has one good female friend — Autumn — whose family is also caught up in the diplomatic world. Felicia’s life seems to be idyllic, but she’s had a few bad scares overseas (including a mugging in Nairobi when she was only thirteen), and her parents are more like friends she sees every great once in a while than real, hands-on parents. Felicia ends up in the United States, away from both parents, and falls in love with a good, kind, studious and respectful young man — Neil. But Felicia doesn’t think she’s good enough for him due to what’s happened in her past. Mind you, all of this comes out in memories — flashbacks — rather than directly, because Felicia is dead. She died the day before her eighteenth birthday, and it’s because her life wasn’t particularly resolved that she’s in Level 2 — Purgatory — reliving everything in order to somehow come to terms with it. Yet the angels who run the place — the Morati — have decided that they’re unhappy with their lot. They wish instead to use the deceased humans as a source of energy (as Felicia says flat out, “Shades of the Matrix!”) as a way to somehow storm Heaven proper and speak with God Himself — or at least with some higher level angels, so they can do some work that’s better suited to their overly grandiose views of themselves. That’s why Level 2, rather than being truly like Purgatory where souls come to terms with all they’ve done (good and bad alike), has become segregated by gender and age. Has become a sort of “memory storehouse” where memories are played back by a type of computer, and other “users” are able to rate your memories, the same way users online rate various things right now. And as if all that wasn’t enough, Julian, too, is dead, and still has plans for Felicia . . . . Ultimately, Felicia has to decide what she’d rather have: her addiction to her good memories (because yes, the Morati have gone there, too, being bad angels), or reliving everything, the good and bad alike? Because only by doing the latter may she eventually find Neil — and get off Level 2 for good. This is an intriguing take on the afterlife, and Ms. Applehans does it well. The “love triangle” between Julian, the bad boy, and Neil, the obvious good boy, is well done. (Julian has a number of secrets of his own, so he’s not as stereotypical as all that.) Felicia’s devotion to her female friends (Autumn in real life, Virginia and Beckah in the afterlife) is well-drawn. And her lack of connection with her mother, along with her stronger but still not quite strong enough connection to her father due to their joint love of music, also makes sense. Mind you, I wanted to shake Felicia’s parents. Especially her mother, who really was not admirable in any way, shape or form despite her high-powered career. At least Felicia’s father gave a damn about Felicia and tried to help her, whereas Felicia’s mother was just . . . well, a waste of space. The only drawback here (aside from Felicia’s useless mother, who at least serves as a plot point) is that Felicia never quite figures out that Julian ended up being the catalyst for everything that followed in her life — good and bad alike. (Julian definitely realizes this, but seems to enjoy keeping Felicia in the dark.) As Felicia is intelligent, albeit inexperienced, this was a bit puzzling. Bottom line? I enjoyed LEVEL 2, and believe that if you enjoy young adult novels, dystopian fiction, sweet romance or a new take on the afterlife — or better yet, all at once — you will also enjoy Ms. Applehans’ debut novel. E.C. Myers’ FAIR COIN is a suspenseful book set on present-day Earth that contains elements of fantasy and science fiction. In FAIR COIN, we meet Ephraim Scott, a normal sixteen-year-old-boy who’s worried about girls, school, and his alcoholic mother; however, his life changes the day someone who looks exactly like him dies. His mother gets called down to identify the body; horrified that her only son appears to be dead, she ends up drinking herself into an alcoholic stupor. When she ends up in ICU, Ephraim investigates what happened and searches “his” belongings; only then does he find an unusual coin, a commemorative quarter that has Puerto Rico on it and a date of 2008, which clearly isn’t right as Puerto Rico is only a Commonwealth, not a state. Then, when Ephraim goes to school, he finds a note that tells him that all he has to do is flip the odd coin to make all his dreams come true; it appears to be in his best friend Nathan’s handwriting. Figuring he has nothing to lose, Ephraim first wishes for his mother to get better and ends up, somehow, in a parallel universe where his mother never identified a body that looked exactly like his — in this universe, Ephraim’s mother, while still an alcoholic, isn’t in the hospital at all. Confused, Ephraim flips the coin again and asks for two things: for his mother to be well (no longer an alcoholic) and for Jena, the girl he’s been interested in since the second grade, to like him. This actually happens, and Ephraim grows even more confused; when other strange things happen, like a set of identical twins becoming only one person instead of two, and when his best friend Nathan no longer knows him, Ephraim knows something is deeply wrong. Fortunately for Ephraim, his love-interest, Jena, is a budding young physicist and recognizes the “parallel worlds” theory from her studies. She does her best to explain things to Ephraim, but then the unthinkable happens — a version of Nathan shows up who’s violent and irredeemable. Nathan causes problems for Ephraim, for Jena, and for Jena’s analogue, Zoe, because of one thing: Nathan wants the coin, and he will kill in order to get it. So, will Ephraim figure out what’s going on before it’s too late? Or will Nathan gain the coin, and its unusual powers, for himself? FAIR COIN is a nice action-adventure story with parallel worlds and some romance. It relies on the plot carrying the characters rather than the reverse, but isn’t necessarily bad; the plot demands that Ephraim be a teenage “Everyman,” and it’s plausible that bookworm Jena would understand enough about parallel worlds and string theory to explain it to lovesick Ephraim. In addition, I never really understood why Ephraim’s mother felt so terrible about life that she’d ended up as an alcoholic. And considering that the whole plot depends on us believing Ephraim’s mother is in bad shape, this is a bit strange. Once again, the only reason Myers gets away with this is because Ephraim’s mother is an archetype, so the reader immediately categorizes her and then doesn’t worry any more about it. Bottom line: there was no reason to use so many archetypes. One per book is usually all most readers are likely to tolerate; here, we have three. Worse yet, Ephraim, his mother, and Nathan may as well have been cardboard characters, as for the most part they lacked personality. More to the point, they lacked soul, which is why I did not believe in any of them. Fortunately for Myers, he has two very strong characters in Jena and Zoe to help pick up the slack; they have real motivations and idiosyncracies, and I believed they could be real people existing somewhere (or somewhen). Without them, I’d not have wanted to finish this novel. That being said, the action-adventure works. The romance, for the most part, worked, though I kept thinking Jena deserved better. The plot was fast-paced and well-written, which I appreciated, and helped distract me from how much I hated the use of all those archetypes. FAIR COIN is a good novel for young adults, but falls short of the exceptional read I’d hoped for, mostly because Myers needs to stop using so many archetypes. While he tells a nice story, he must learn to draw up characters with a bit more weight and heft to them, as plot will only carry you so far. 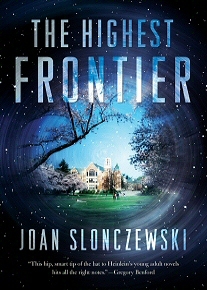 Joan Slonczewski’s latest science fiction novel is THE HIGHEST FRONTIER, which is a near-future novel based mostly on a space habitat located above the Earth called Frontera. The Earth, especially North America, has largely been ruined by climate change, which is why most of the best scientists, artists, and even athletes have removed to various space habitats. Frontera is just one of a number of space habitats; it’s home to an excellent college, to one of the world’s best slanball teams (slanball reminds me a great deal of Quidditch, except without magic and by using gravitational fields instead), to a number of farmers, and to some mind-blowing science, particularly of the physical and biological variety. You see, the near future is a very strange place. People get to and from the various space habitats by going up strands of anthrax — harnessing a dangerous biological weapon this way is a nice touch — while taxes now get “played” at casinos, and there’s an upper limit as to how much you’re allowed to lose. Biological science has taken a gigantic leap forward, partly due to an “alien invader” called ultraphyte, a type of creature that seems infinitely adaptable and is usually deadly to human beings in any form. The heroine of our tale is Jennifer “Jenny” Ramos Kennedy — yes, of that Kennedy family, though she tends to think more of the Ramos side of the family as they’ve been the more recent occupants of the White House — a multifaceted young woman with unusual skills. Jenny is a trained first-responder — meaning she has advanced first aid skills, which are aided by advanced technology — and as ultraphyte has been called, more or less, one of the top “enemies of the state,” she’s used to decisively dealing with ultraphyte in a way that leaves behind as little as possible (as the wily little devils can seemingly reconstitute themselves out of the thin air, though in actuality they need salt and a lot of it in order to reproduce and thrive). And because Jenny’s recently lost her twin brother, Jordi, due to misadventure, she’s hurting, alone, scared, and sad in short order — yet she’s bound and determined to improve her life by going off-world to Frontera, which shows an unusually steely set of nerves. At Frontera University, Jenny studies under biologist and Nobel Prize winner Sharon Abaynesh; this is much more important to the plot than it seems at first, as Abaynesh is one of the few people who seem to realize that the ultraphyte are more than invaders — they are sentient, sapient beings who may well not be as opposed to humans as they seem. Along the way, Jenny has her first romance; she plays a lot of slanball; she gets frustrated because she “only” gets an A (grade inflation has taken place, and now she expects an A-triple-plus on everything or she figures she’s falling short); she works on her public speaking skills, as she knows she’s deficient in that area and as the scion of a political family, that just won’t do. And she interacts with just about anyone who’s anyone on Frontera, partly because of her high social standing, but mostly because it’s integral to the plot that she do so. Look. This is a book that’s really high on ideas. The way the Internet is newly-conceived as “ToyNet” is a brilliant touch. The space habitat (“spacehab” in Slonczewski’s parlance) is well-conceived, and seems like something that would actually work. The way real food is prized and coveted — and is a rare treat — makes sense due to its scarcity in a world that’s now low on natural resources. And the overall, overarching plot makes sense, which I was glad to see. But there was something about this book for all its brilliance that bothered me, and that’s the fact that our heroine, Jenny, just wasn’t strong enough to hang the plot around. While I liked her and often empathized with her, I kept thinking that the only reason Jenny was the main character here was because Slonczewski wanted to write a young adult novel, thus Jenny had to be the main character. And that’s just not good enough. I’ve read Slonczewski’s other novels, including the John W. Campbell award-winning A DOOR INTO OCEAN, which is outstanding and a must-read. She is a scientist by training and temperament, which is why the science of the space habitat is first-rate and why the overall near future world is worked out to the Nth degree, even to the point of Cuban-inflected Spanish loan words due perhaps to the fact that both Puerto Rico and Cuba are now part of the United States of America. But when you have a main character who, while likable, just can’t hold my interest, that’s not acceptable for a writer of Slonczewski’s caliber. And that’s why, despite the fact that the world-building and overall scientific background of THE HIGHEST FRONTIER are uniformly excellent, I feel this novel fell a bit short of the mark. Scientific knowledge (AKA, “Is this world plausible?”): A-plus. Overall grade: A very generous B. My advice is to wait for this one to come out in paperback, or possibly get it from your local library; while the ideas here are outstanding, the characterization isn’t. And that’s a shame.